School started today. WOOHOO! Ahem. Sorry. I'm down to having only three children clambering for my attention for 7 hours a day. 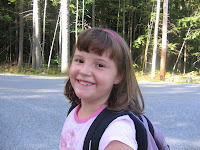 Meg is a big 2nd grader now. As I told my brother, she is at the upper tier at her school, as it is only a K-2 school. She was quite nervous this morning, but came home happy and wants to go back tomorrow. Aren't 2nd graders cute? For my part, I was very happy for her to go to school today. If you've read my blog this summer, you know that a) I had very sick kids for a good part of July, b) I was frustrated much of the time and c) that I've been sick for about 3 weeks now. I am also of the opinion that summer is completely overrated. Oh sure, a little vacation is good for the soul, but so much time with the kids all home makes us all nuts and wanting to get away from each other as fast as possible. I'm counting the hours until Drew's preschool starts next week. I can't seem to shake what I thought was a sinus infection. I've had my time with the antibiotics, and now have a nasty cough that just lingers. Today I got the thrill of having a chest x-ray, and blood work to determine if I have pneumonia, or just bronchitis. Tomorrow I hope to have more details. And drugs. Good drugs. I hate summer. It's tedious. And hot. Neither of which are my friends. Ahh, drugs are good. Hope you feel better soon. I agree, people get all hyped up for summer, I don't. I honestly, and I know you probably don't want to hear this, get all hyped up for winter. whoohoo for meg's first day : ) she's the bwoc this year, what a thrill : ) tho i hope you don't have pneumonia, i do hope drugs will fix whatever it is. and count me in on the summer hating. ugh. it's hot. you sweat. the kids get bored (even w/ going to daycare all day and swimming and etc.) and it's hot. Hugs and get well wishes. All hail the end of Overrated Summer!!! And the advent of Blessed Fall!!! Hooray!!! !